Hello, my name is Bracken! Male (Medium). Bull terrier x. Adult - DOB: 2010. 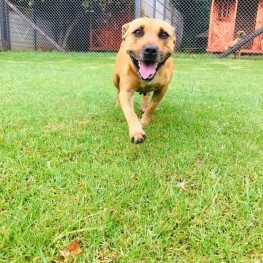 He is a 5 year old, Pitbull X bull terrier of medium build. Gorgeous little doggy with a sweet nature. Lives happily with a 7 & 1/2 yr old female bull terrier. He disappeared from High Road, Eastleigh, Edenvale on Tuesday evening 22nd December ’15. Reported to Edenvale SPCA & local vets as soon as discovered missing. We have searched the neighbourhood, parks, etc.